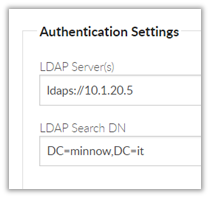 The administrator can configure the authentication settings for Active Directory under Foldr Settings >> General >> LDAP. If Active Directory is not being used, this section can be skipped, and local user accounts created directly in the Users & Groups tab in Foldr Settings. If the domain supports LDAPS, simply prefix the LDAP Server address with ‘ldaps://’ – You can optionally append a port; if this is not done Foldr will assume the default port of 636 is being used. 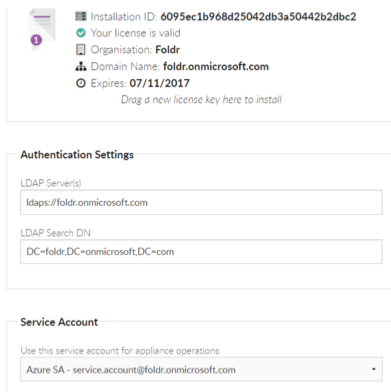 Foldr can be deployed within the Microsoft Azure cloud platform and can authenticate directly against the Azure Active Directory without the need to deploy additional Windows domain controller VMs. 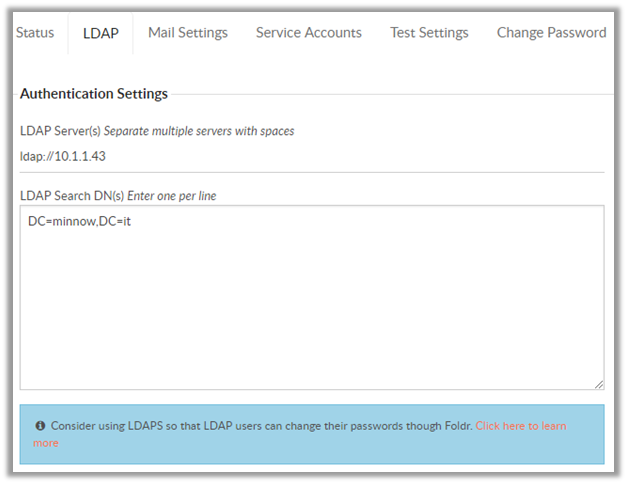 You can authenticate using either LDAP or LDAPS (a suitable SSL certificate needs to installed within the Azure portal for LDAPS support). Note – All features are available if Foldr is configured against Azure Active Directory apart from password change control / delegated password reset, regardless if LDAPS is enabled.